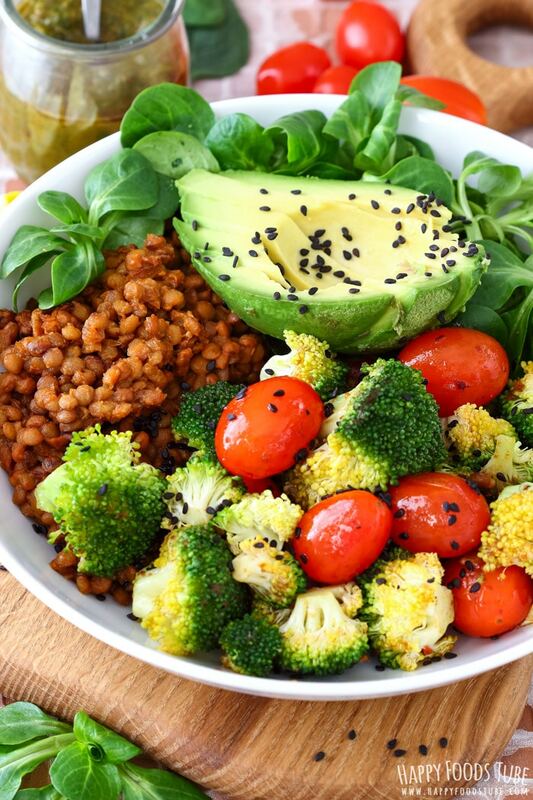 This Warm Buddha Bowl is packed with lentils, pan-roasted tomatoes and broccoli as well as fresh avocado and lamb lettuce. 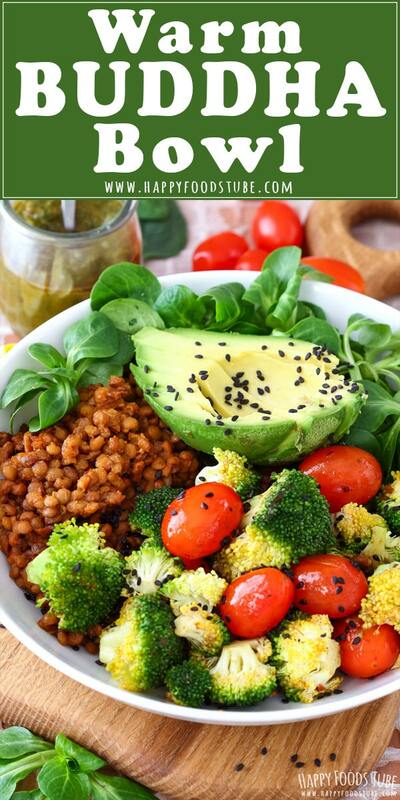 Add spinach and sun-dried tomato dressing to this healthy Buddha bowl for some more nutrients. Guys, January is all about the good – healthy stuff. I guess after the Holiday feast our body needs some time off of the massive over-eating, right? Well, I definitely feel like mine needs it. So I made us a warm Buddha bowl! Buddha bowl, nourishing bowl, power bowl or any kind of a food in a bowl is one of my favorite things to eat. These bowls are super easy to make, they are usually quick to whip up and can be eaten warm or cold. 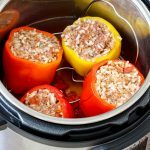 They are perfect for quick lunch or dinner. 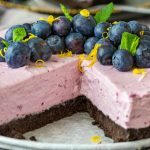 I make them especially when I have only bits and pieces in the fridge because I can use up all of them! 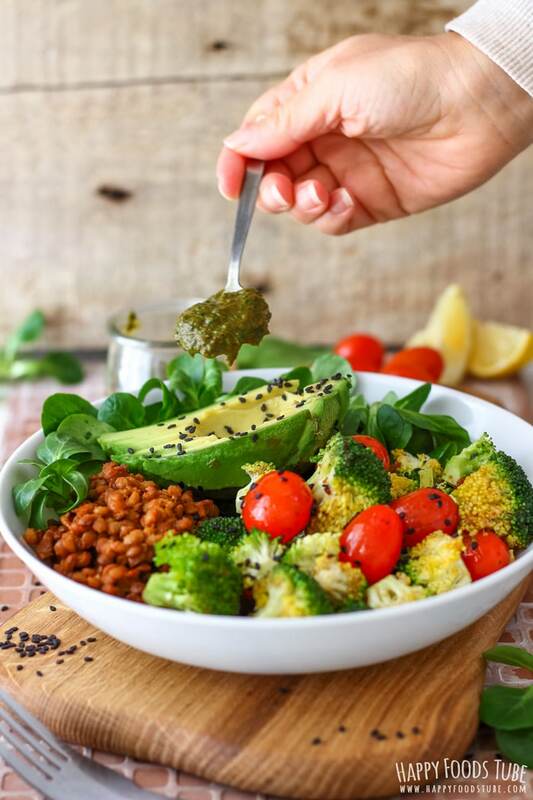 If you want to know more about Buddha bowls – like why is it called a Buddha bowl, check out the history of Buddha bowl. 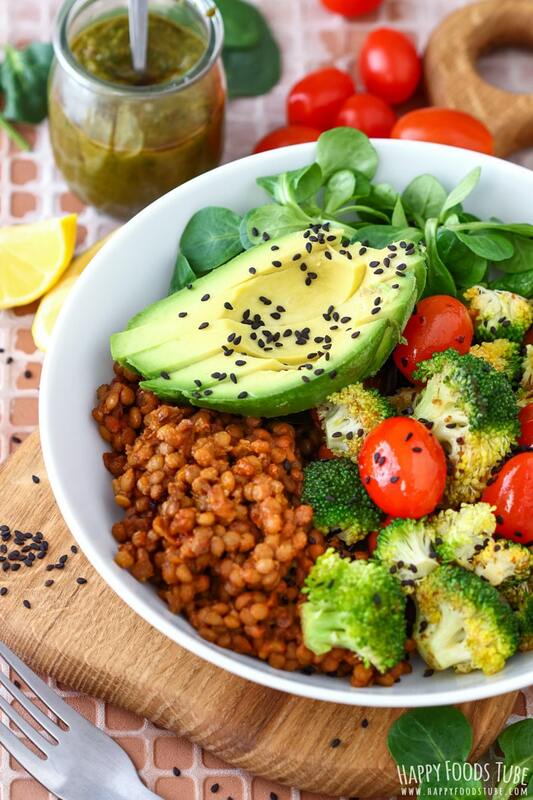 How to make warm Buddha bowl? 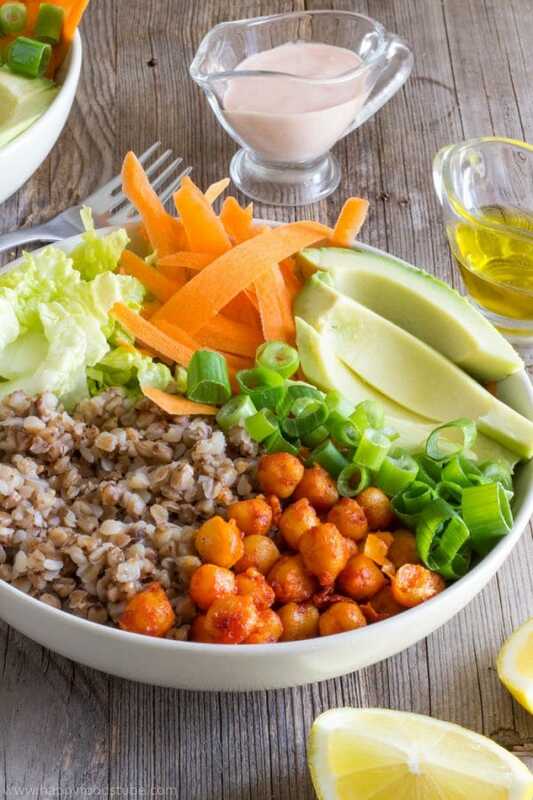 This easy-peasy recipe for Buddha bowl doesn’t require much. 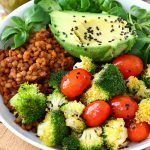 Roast cherry tomatoes, lentils and broccoli and arrange them in two bowls altogether with the rest of the ingredients. 1st: Cook veggies first, remove from the pan and then cook lentils. 2nd: Cook the vegetables, then move them to one side of the frying pan. Add lentils to the other side and cook those. This way you will make sure that all your warm ingredients are still warm by the time you finish the cooking. 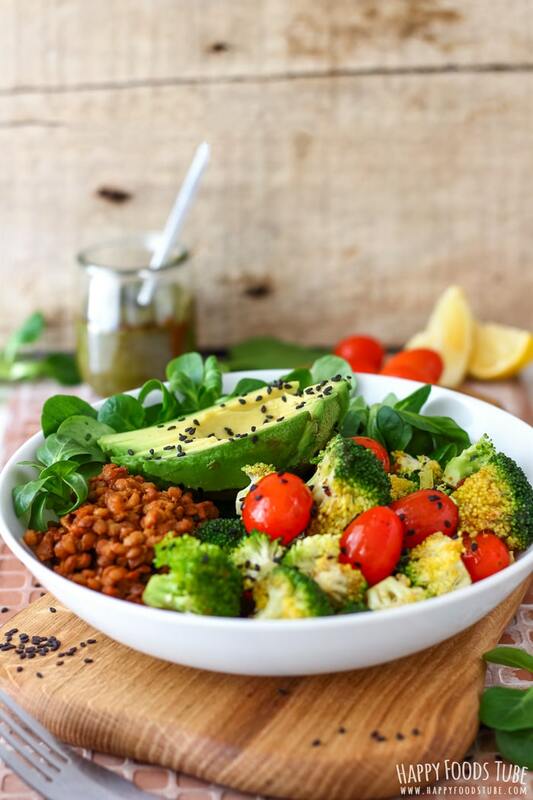 To add some extra flavor and nutrients to this warm Buddha bowl, you can make a spinach dressing like I did. 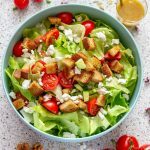 The dressing is very simple and only takes about 2 minutes to put together. Combine spinach, sun-dried tomatoes (that you have soaked in warm water first if they are hard), olive oil and water. Blend this until smooth-ish. You can add more water or oil t thin it down a bit, if that’s what you like. However, you might need to add some extra seasoning. Pan-roasting: To add some extra flavor to lentils I like to use butter but you can use olive oil as well (especially if you want to make this into a vegan Buddha bowl). Then stir in some sweet paprika, roast for a bit and that is it! To pan-roast the cherry tomatoes with broccoli all you have to do is add some oil to your pan/skillet and roast them to your liking. It takes about 3 minutes. When done, all you have to do is fill your bowl with the warm veggies, avocado, lettuce and the dressing. 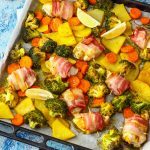 This is a very versatile recipe so if you feel like adding less/more tomatoes, broccoli, avocado, etc, feel free to do so! 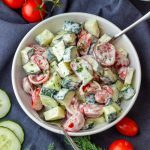 Use olive oil instead of butter to make it vegan friendly! Omit the dressing completely if you don’t like it or use your favorite one instead! 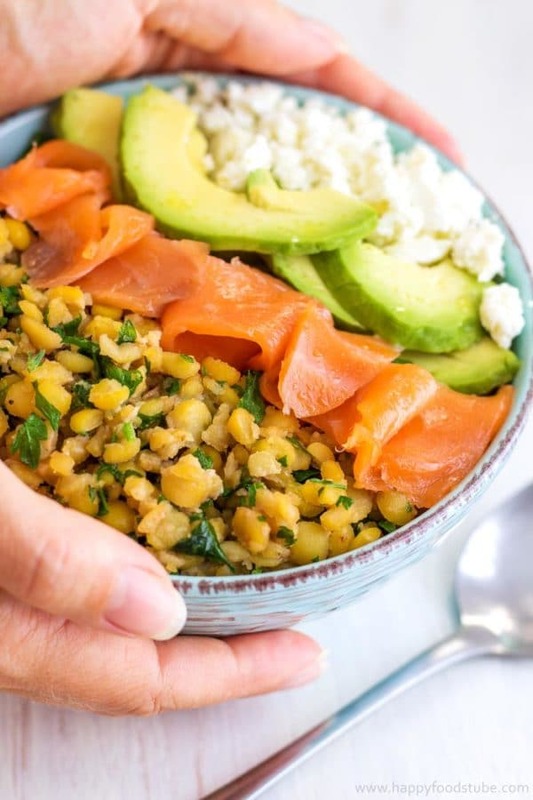 Extras – I like Feta cheese a lot so I would normally add some to this warm Buddha bowl as well. To add an extra protein you can also add soft-boiled (or hard-boiled) eggs. Lamb Lettuce – arugula (US)/rocket (UK) or romaine lettuce works also well here. Cherry Tomatoes – you can use normal tomatoes and cut them into chunks but cherry tomatoes will give you better flavor. So if you can, go for the cherry tomatoes. Butter – I used butter to roast the lentils but you can use olive oil instead. Cooked Lentils – cooked and roasted chickpeas as well as split peas are delicious alternatives. Pour the oil in a large frying pan. Add cherry tomatoes and broccoli florets and roast them for about 3 minutes. Move them to one side to make space for lentils. Add butter, salt, paprika and stir around. Cook for a further 2-3 minutes before turning off the heat. Peel and half the avocado, remove the stone and cut into slices. Fill each bowl with lettuce and avocado. Add roasted veggies and lentils and top with sesame seeds. 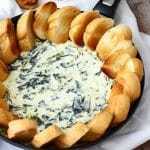 Serve with spinach and sun-dried tomato dressing (optional). To make the dressing: Combine all the ingredients in a food processor and pulse until smooth-ish. Make sure you drain any liquid from the lentils before adding them to the frying pan. Black sesame seeds can be substituted with white sesame seeds, chia seed or poppy seeds. Vegan option – use olive oil instead of butter. Roasted split peas or chickpeas can also be used instead of lentils. Oh wow! 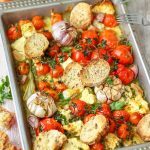 This looks like the ultimate healthy comfort food! Can’t wait to give it a go! I love buddha bowls, this one looks so fresh and colorful! WE love lentils and use then all the time. This is a great healthy and nutritious meal. Perfect for lunch or dinner….and leftovers are always welcome too.